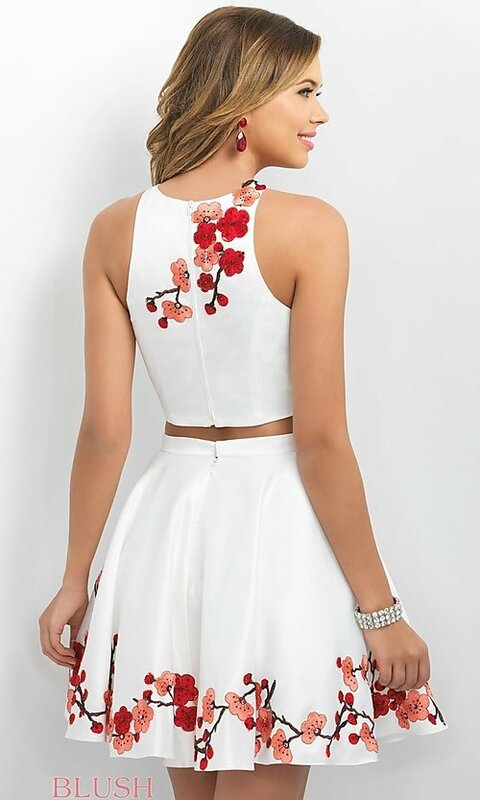 Celebrate your homecoming in this gorgeous two-piece party dress that captures the beauty of cherry blossoms in springtime. Vibrant pink and red embroidered appliques burst across the front of the sleeveless white crop top and delightfully appear again on the back. A wave of cherries and blossoms dance across the short hemline of flared white a-line skirt on the one-of-a-kind two-piece short dress. For under $200, you can look and feel amazing in this designer homecoming dress from Intrigue by Blush that is sure to be a breath of fresh air.